A week ago the Census Bureau released the Advance Monthly Retail Sales report for September. When adjusted for seasonal factors and holidays in the reporting period, September sales showed a slight 1.1% increase from August and an almost 8% increase over September 2010 sales. A tepid – but better than expected – employment report the previous week and growing consumer sales has countered fears that the U.S. might be entering a double dip recession. Hopes that Europe will reach some resolution to their debt crisis and the reduced fears of another recession have helped power the stock market almost 15% higher from its October 4th lows. Has the U.S. consumer come back? 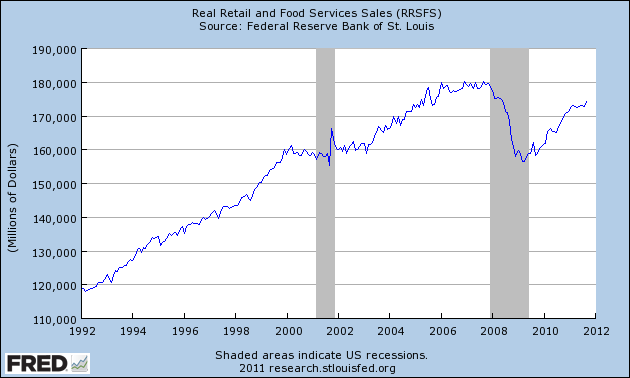 Below is a 20 year chart of seasonally adjusted retail sales in inflation adjusted dollars. As you can see, we are still struggling to reach the levels of 2007. The Christmas season can account for 40% of many retailers annual sales. The other nine months of the year, from January to September, show the underlying resilience of the consumer economy. 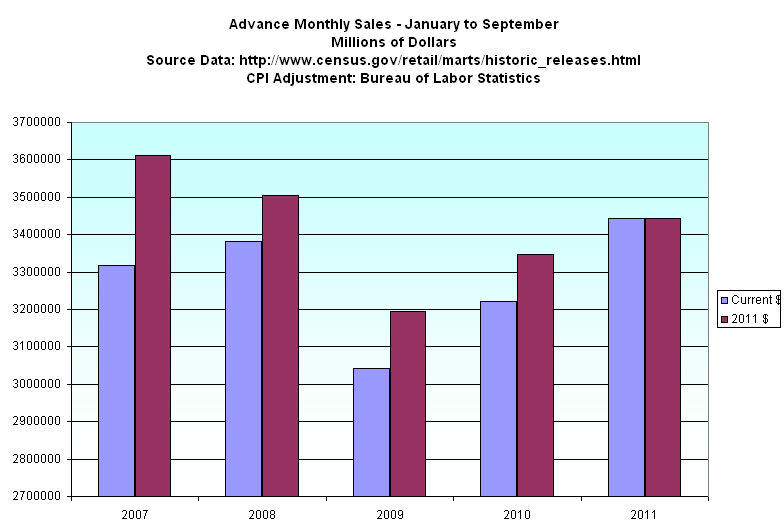 I pulled up the September Advance Monthly reports from the Census Bureau for recent years to get a comparison. I used Bureau of Labor Statistics CPI data to show sales in real dollars. Although we have finally surpassed the nine month total of 2008 in current dollars (violet bars), the inflation adjusted sales figures show that we are still below the levels of 2007 and 2008. State and local governments rely on sales taxes for about a third of their tax revenue. The Census Bureau reported that sales tax revenue for state and local government in 2010 was $17 billion less than 2007, a 4% decrease. In inflation adjusted dollars, the decrease in sales tax revenues is almost 12%. How have state and local governments made up the shortfall in sales tax revenues? Corporate income taxes increased 50% from 2007 to 2010, more than making up for the decline in sales tax revenues. Property taxes make up 30% of tax revenues for state and local governments. Given the sharp decrease in house prices, I would have expected that property tax revenues would have declined but changes in property taxes lag changes in the market price of houses. In 2010, property tax revenues were 10% above 2007 levels, double the 5% inflation rate for that period. Although 2011 figures are not available yet, I would expect that property taxes declined this past year. State and local governments are praying that there is a pickup in retail sales to compensate for reduced property tax revenues. The bottom line? The pressure points may shift but the pressures on the economy as a whole remain constant. Private industry continues to add enough jobs to compensate for population growth and reductions in the workforce of state and local governments but not enough to bring down the unemployment rate. Revenues to state and local governments may show slight improvement but not enough to keep up with inflation, and certainly not enough to rehire these lost government jobs in the near future.